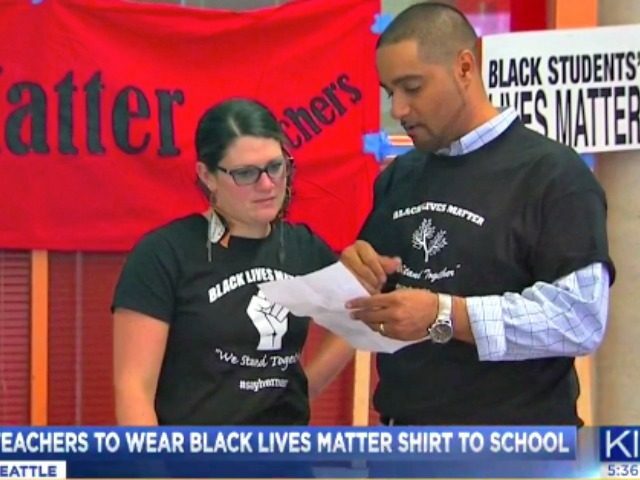 Thousands of teachers across Seattle plan to wear Black Lives Matter T-shirts to school Wednesday as part of an organized effort to teach curriculum and support student activism related to closing the opportunity gap between different races, KIRO reports. The teachers plan to wear the shirts district-wide Oct. 19 in response to threats made from outside the district against teachers at John Muir Elementary. Breitbart News previously reported that teachers at John Muir Elementary wore Black Lives Matter t-shirts to protest “systemic oppression” in mid-September. Seattle Education Association, a union which represents more than 5,500 educators, is endorsing “Black Lives Matter in Seattle Public Schools” on Oct. 19. There have been no reports of threats to the event so far, KIRO reports. SEA President Phyllis Campano said she hopes that the event spurs a conversation about race and education and promotes students of color. Seattle Public Schools told teachers they can teach about the movement in class so long as they do not promote religious or political values. A spokesperson for the district said that the school respects teachers’ rights and desire to express themselves. He added that the school hopes the message on the t-shirts inspires people to do the work of eliminating opportunity gaps. Seattle Public Schools has planned a campaign that focuses on highlighting achievement gaps in the classroom.